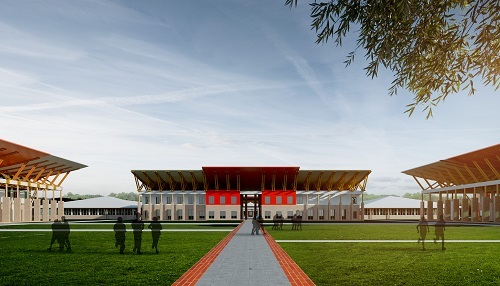 The M-PESA Foundation has announced that it is constructing a state of the art, mixed boarding high school that will seek to provide a first class, unique education to gifted but economically disadvantaged children from all counties of Kenya. Inspired by entrepreneurial leadership and drawing on advanced technologies, the M-PESA Foundation Academy will innovatively deliver the KCSE curriculum in a world-class educational facility. First class sports, arts and cultural facilities, in addition to academic facilities, will include an indoor sports hall, a sports field, running track, swimming pools, squash courts, a music centre and a 500 seat auditorium. In line with the rapidly growing technological world, the Academy will employ the latest technology to aid the students in their studies whilst at the same time providing them with the technological skills to meet the future demands of business in Africa. Situated along Mang’u-Thika Road the Academy will open in January 2016 with an initial intake of 90 students and will ultimately have a capacity of 800 students by 2019. The move is in a bid to empower large scale and long term sustainable projects that that aim to have maximum impact on Kenyans in the areas of education, health and environment with efforts to make it home for transformative education in Kenya. As part of its commitment to ensure that the M-PESA Foundation is well-grounded in best in class education, the Foundation will be hosting a cross-sector Educational Symposium in May to start a comprehensive conversation on the state of Kenya’s education sector. The forum will bring together key stakeholders in government, education and the corporate sector to discuss how Kenya can reap the benefits of leadership and technology in our education system. The M-PESA Foundation Academy will empower, train, and provide an environment in which educators can rethink the way that KCSE subjects are delivered to ensure that student needs are at the core of the learning, and keeping teachers continuously trained and engaged as key facilitators in the education process. “If Kenya aims to develop transformational leaders for our future economic growth, it must adopt an innovative approach to education. We feel that bringing together the kind of expertise that led to the creation of M-PESA and the Safaricom Academy will prove beneficial to this project,” said Onesmus Mbogo, Country Manager, IDC East Africa. Can drones be used to curb exam cheating in Kenya? M-Pesa transaction rates going down?